Take the worry out of getting to the ceremony on time. 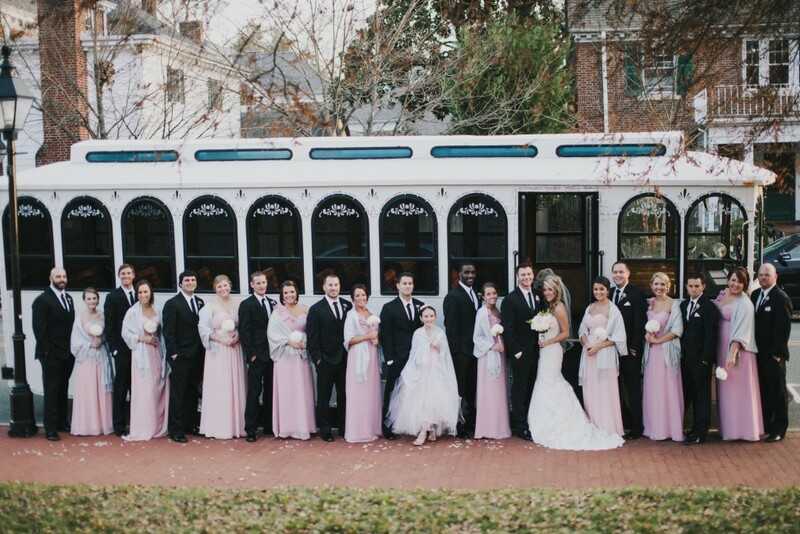 Trolley Tours can transport the Bride and bridesmaids, as well as the Groom and groomsmen, to the wedding venue. If you have out-of-town guests staying at one or more local hotels, take the guesswork out of finding the wedding site. Have them ride a trolley to the ceremony. Is parking an issue? We can shuttle the wedding party and/or guests to the reception. Some wedding parties ask us to take them to various spots around Fredericksburg for pictures. At the end of the celebration, we can deliver passengers safely back to their hotels. We can provide transportation for rehearsal dinners. Looking for something fun to do with your bridesmaids before the big day? Reserve a trolley for our Wine Tour. If your guests will be in town a few days, reserve a trolley for a private tour of historic Fredericksburg. Otherwise, let your guests know about our daily tour, which departs from the Fredericksburg Visitor Center at 706 Caroline Street in old town. $100 per hour per trolley after the initial four hours. The time can be divided. For example, the clock starts when our driver leaves the garage, transports passengers to the venue and returns to the garage. Time stops. The clock starts again when the driver leaves the garage for the return shuttle(s) and then parks at the garage at the end of the service. A “Just Married” banner across the back of the vehicle and/or decorations inside of the trolley can be provided at no extra cost. We can provide an AUX cord for our PA system so you can play your favorite tunes using a storage device, such as a mobile phone or iPod. * Rates subject to change. Please contact us for a specific quote.